1. Settings color- The light next to the word settings indicates the current setup of Bubbler GPS as it relates to your http://SpotWalla.com account. Green means you are set up correctly! A red light indicates a missing/invalid login/password OR device setup. An orange light indicates the settings could not be verified due to an invalid internet connection. Clicking on the word "Settings" will take you into the settings dashboard. 2. Internet color- Green means you have a valid internet connection and you can communicate with SpotWalla.com. A grey/off light means no internet connection is currently available. 3. New Message- Clicking on the Bubbler GPS logo will take you into the "Messages" page where you can send OK, Custom, Food, Fuel, Rest, Sightseeing, Law Enforcement and Bonus/Flag messages. You may also take pictures (Pro version only) and enter any text you would like to accompany that message. 4. Last Activity Detail- This indicates the last time the GPS on your phone attempted to determine its position, whether successful or not. 5. Last GPS Point- This is the last successful GPS position obtained by Bubbler GPS. A successful position must be at least 100 meters from your last position. Imagine an imaginary circle 200 meters wide with your last position in the middle. You cannot have a new successful position until you cross outside of that imaginary circle. 6. Last Upload- This is the last time that your phone updated your position with SpotWalla.com. 7. Points Waiting- This indicates how many track points and messages are waiting to be sent to SpotWalla.com. By default, positions are updated every 10 minutes in Bubbler GPS Pro, and every 15 minutes in Bubbler GPS Lite. 8. Update Now- This forces both a position update, as well as an upload to SpotWalla.com. You can do this to "force" a point into SpotWalla.com (If you are more than 100 meters away from your last position), as well as upload any points that are waiting. This feature is useful in areas of poor internet reception when a connection is only available for a short period of time. 9. 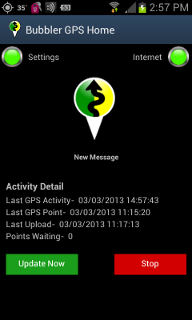 Stop- This stops Bubbler GPS from creating new points, and from uploading any existing data. Pressing "Update Now" will restart all processes.